I remember when my wife was pregnant, she used to have craving for desserts more than before. While searching for a good recipe for a dessert which can give a good nutrition as well, I came to know about Ragi/Nachini Ladoos. These are rich in Vitamin-B Complex. It’s easy to prepare Ragi/Nachini Ladoos. Add the Ragi/Nachini flour and cook over a low flame stirring continuously till it turns golden brown in colour. Add the Sugar Free Natura, cardamom powder, raisins, cashews and mix well. Remove from the flame and pour onto a plate (thali) and let it cool completely. Divide into 12 – 14 equal portions and shape each portion into ladoo. They don't look much tempting but this a very healthy and sugar free dessert. These are also rich in calcium. 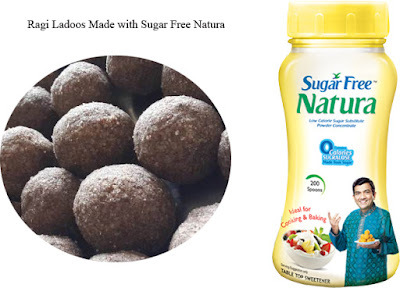 Visit http://sugarfree-india.com/ to know more about Sugar Free Natura.